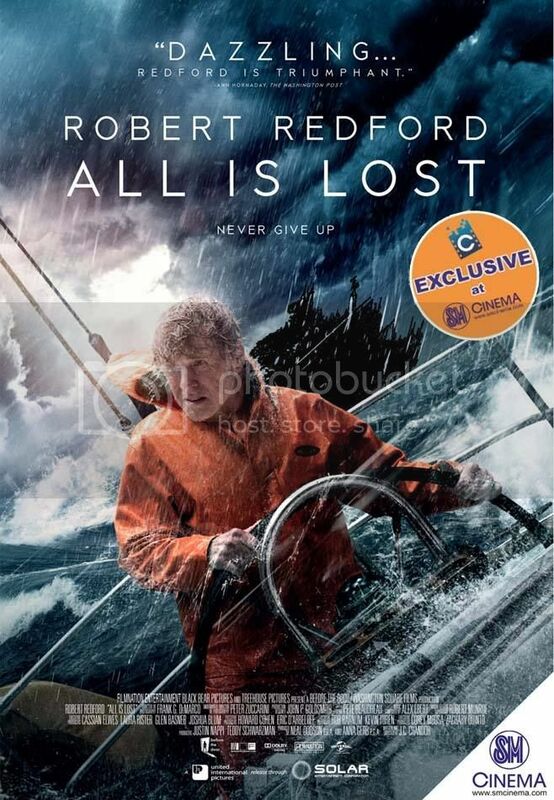 SM Cinema, the country’s leading exhibitor—boasting 246 cinemas and 6 IMAX Theatres in 45 branches nationwide, brings Academy Award® winner Robert Redford to Pinoy fans via the big screen in “All Is Lost,” an open-water thriller about one man’s battle for survival against the elements after his sailboat is destroyed at sea. The movie opens exclusively at SM Cinema this February 5. E-PLUS members get 50% discount on movie ticket. Written and directed by Academy Award® nominee J.C. Chandor (Margin Call) with a musical score by Alex Ebert (Edward Sharpe & The Magnetic Zeros), the film is a gripping,visceral and powerfully moving tribute to ingenuity and resilience. The film is distributed in the Philippines by Solar-UIP. For a more convenient way of watching a movie, experience the newest from SM Cinema—the CINEMOBILE: Your mobile, your movie ticket. With its turnstile system, SM Cinema delivers a more convenient movie-going experience to its patrons. You may also avail SM Cinema’s e-PLUS (Entertainment, Privileges, Lifestyle, Upgrades and Surprises) card to make your movie-watching more convenient, rewarding and fun. On top of the reward point scheme, e-PLUS is loaded with VIP privileges, special promos such as discounts on select movies, seasonal offers, quarterly raffles and invites to exclusive events. e-PLUS members can also avail of promos and discounts from partner merchants. The e-Plus starter kit comes with your personalized e-Plus card, free movies, snacks and a premium item. To know more about SM Cinema, visit their website at www.smcinema.com. To get updates, like them on Facebook (facebook.com/smcinema) and follow them on Twitter (twitter.com/sm_cinema). To connect with IMAX on Facebook, like facebook.com/imaxsmcinema and follow them on Twitter.com/imax_smcinema.